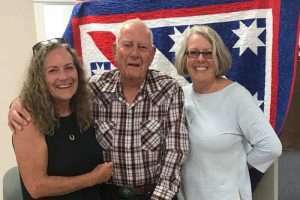 What a beautiful way to honor a WWII veteran, 70 (yes, seventy!) years after his service. This quilt was recently presented to the father of Terri Topmiller, one of the amazing women in our film. 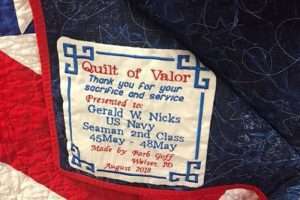 Terri made a special trip to be with her dad, Gerald W. Nicks, when he was presented with this beautiful Quilt of Valor for his service. Service in the Navy is a theme in Terri’s life. Not only did her dad and late husband serve in the Navy, but so did she! You will learn more about Terri and her life as the wife of a Vietnam War-era combat veteran in I MARRIED THE WAR.